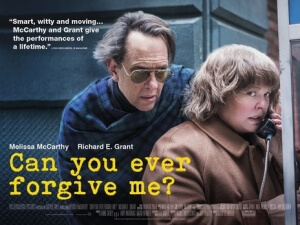 Yesterday’s Oscar nominations revealed that Can You Ever Forgive Me?, the compelling and superbly acted comedy-drama from The Diary of a Teenage Girl director Marielle Heller, was up for three awards, including Best Actress for Melissa McCarthy, Best Supporting Actor for Richard E. Grant, and Best Adapted Screenplay for writers Nicole Holofcener and Jeff Whitty. While all these nominations are certainly earned, it’s a crying shame that neither Heller nor producers Anne Carey, Amy Nauiokas and David Yarnell were nominated for Best Director or Best Picture respectively, especially when some have noticed the lack of female nominees in many of this year’s major categories outside of acting. Part of me wishes that at the very least Heller would get in as a surprise nominee for Director, but then again I figured that Bradley Cooper was also a lock for the category for A Star Is Born and he ended up getting Afflecked, so I guess I don’t know much about how these things are sorted after all (besides, it feels like Alfonso Cuarón is going to pick up his second Directing Oscar for Roma this year anyway, which makes sense because it’s the best film up for Oscars this year). But awards recognition aside, Can You Ever Forgive Me? remains an extremely strong piece of work that is very much an acting showcase for both Melissa McCarthy and Richard E. Grant, in all of the best ways possible. First, though, a plot refresher in case you don’t remember from last time I reviewed this movie; McCarthy plays Lee Israel, a struggling biography writer who isn’t getting hired for work (she bemoans the fact that rival Tom Clancy is being pays millions of dollars for his latest novel while her agent can’t even give her an advance of $10,000), and is subsequently unable to afford rent or medication for her sick cat. By chance, she stumbles across a letter from comedienne Fanny Brice, and upon realising she can sell this sort of content for a large amount of cash, she begins forging letters from several notable figures such as Noël Coward and Dorothy Parker and then selling them to collectors at a decent price. She recruits coke-addled gay bohemian Jack Hock (Grant) into her scheme, but a combination of Hock’s over-eagerness and Israel’s inability to form a meaningful connection with anyone soon leads to run-ins with the authorities. As I mentioned in my previous review, I am so glad that the only films which Melissa McCarthy headlined over the last twelve months didn’t end up being just Life of the Party and The Happytime Murders (both of which McCarthy has also been nominated for at this year’s Razzies, making her the Sandra Bullock equivalent this year of someone who’s up for both an Oscar and a Razzie at the same time), because unlike those other movies Can You Ever Forgive Me? actually utilises McCarthy’s talents as both a comedic and dramatic actress in a role that seems practically tailor-made for her – though it originally was set to be played by Julianne Moore with Chris O’Dowd in the Richard E. Grant role, but as good as those actors are I am thankful they ended up dropping out of this project – and she has never been better as a result. She is so good in this movie that it makes me even madder that she more often than not tends to choose material that is always beneath her, because the same person who has been Oscar-nominate for giving one of the year’s best performances should not also be associated with laugh-free crap that’s usually under the direction of her real-life husband Ben Falcone (who also has a small role in this movie); in fact, out of her upcoming releases I am far more interested in mob comedy-drama The Kitchen than I am in Falcone-directed action-comedy Super Intelligence, because at the very least with the former I am bound to get a performance that is still putting her to better use than the other film most likely will. Richard E. Grant, too, is extremely fun to watch as this flamboyant caricature who the actor injects real humanity into, preventing him from being just this wild and crazy cartoon character that could so easily have felt out of place in this story. Grant, too, is an actor who I feel has been largely underutilised in many films since his memorable debut in Withnail & I, among them notorious stinkers like Hudson Hawk and The Nutcracker in 3D, so it is nice to see him finally be recognised in this capacity, especially when in interviews he comes across as a really nice guy who doesn’t seem to take everything so seriously, and however things may turn out for him on Oscar night he can rest easy knowing that this is (hopefully) not the only time he’ll be at the Dolby Theatre in Los Angeles around this time of year. As for Heller, who again has sadly been overlooked for her quietly emotional direction here, she gives Nicole Holofcener and Jeff Whitty’s jolty script a warm beating heart that makes it easier for us to examine the interior of this bitter, lonely woman and her troublesome friend, even when they are both doing wicked things that aren’t always legal, which furthers her ability to examine and respect her lead characters as much as she did in The Diary of a Teenage Girl. Heller is now working on Fred Rogers biopic A Beautiful Day In The Neighbourhood with lead actor Tom Hanks, which could very well be a major contender for next year’s Oscars as well as a chance for the Academy to finally recognise Heller as a directing force to be reckoned with. After all, Can You Ever Forgive Me? is undeniable proof that Heller has what it takes to make a truly compelling piece of cinema that brings out the very best in the people she’s working with. Can You Ever Forgive Me? is a compelling and wonderfully portrayed comedy-drama that sees director Marielle Heller bring out the very best in lead actors Melissa McCarthy and Richard E. Grant.